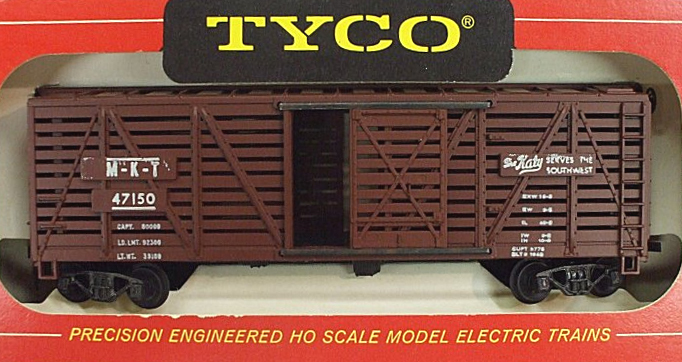 TYCO's Stock Car is a 40' freight car that arrived in the line prior to the Red Box Era and continued to be available with some modifications to its tooling through the end of the HO-scale train line offerings. 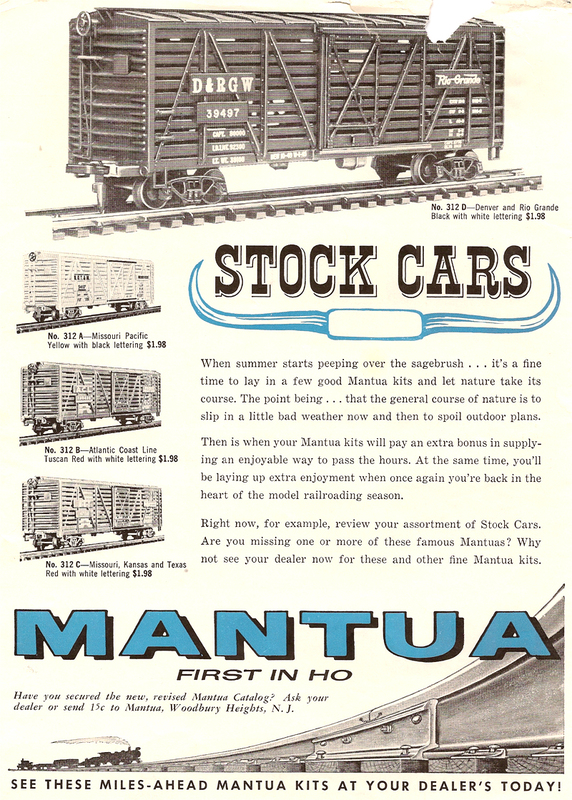 The above image shows an early example TYCO Stock Car decorated for Santa Fe. Earlier production runs can be spotted by the metal rails that the car's door slides upon and the metal coupler pocket. 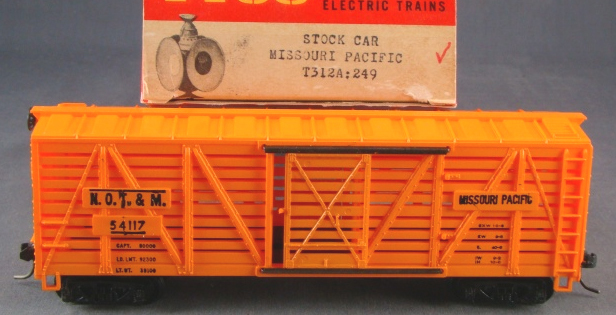 The trucks on this example are also different from the plastic examples found later in Brown Box Era Stock Cars. 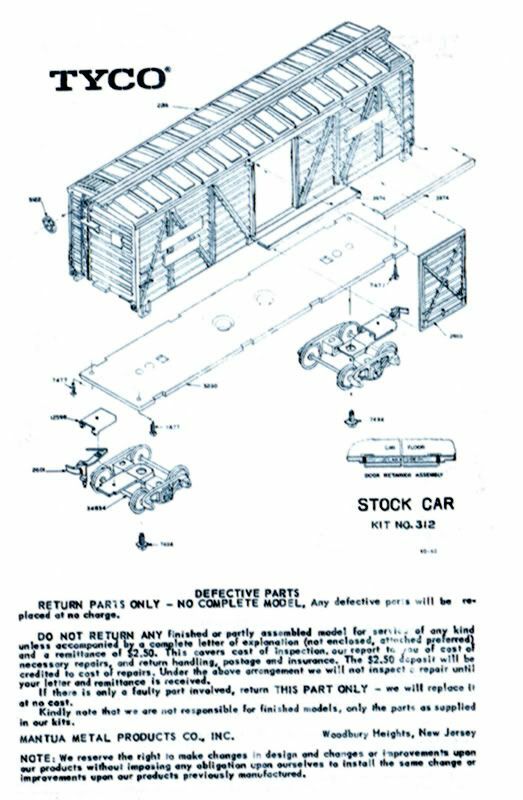 The open steps are also an indicator of an earlier production specimen of this car, as later TYCO freight cars began appearing with filled-in steps. Thanks to Ken Furnevel for the picture. In the roadname listings below you'll note that catalog appearance dates cease after 1966. The TYCO Stock Car was very much available after this point, but separate roadname listings no longer are published in TYCO catalogs of the late 1960s. 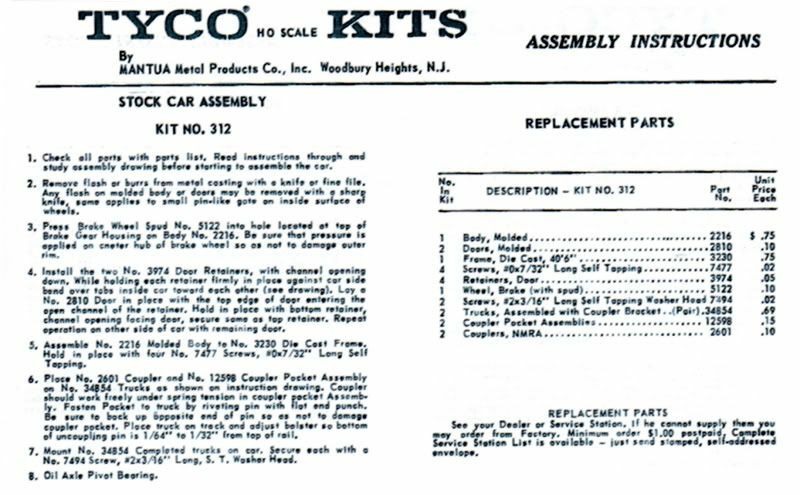 TYCO lists a kit versions, #K312A thru #K312E, in the 1963-64 and 1964-65 catalogs selling for $1.69 each. The kits, #K312A thru #K312E, are $1.89 in the 1965-66 catalog. 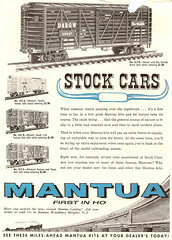 Above is a June 1959 advertisement for the Mantua Stock Car in kit form. You may click on the image to open a larger version for best viewing. You may click on either of the images to view a larger version of the sheets included in TYCO's kit release of the stock car.